47% of children have had a chew on some sort of bug from the garden. Some of the creepy crawlies included were worms, caterpillars and snails. 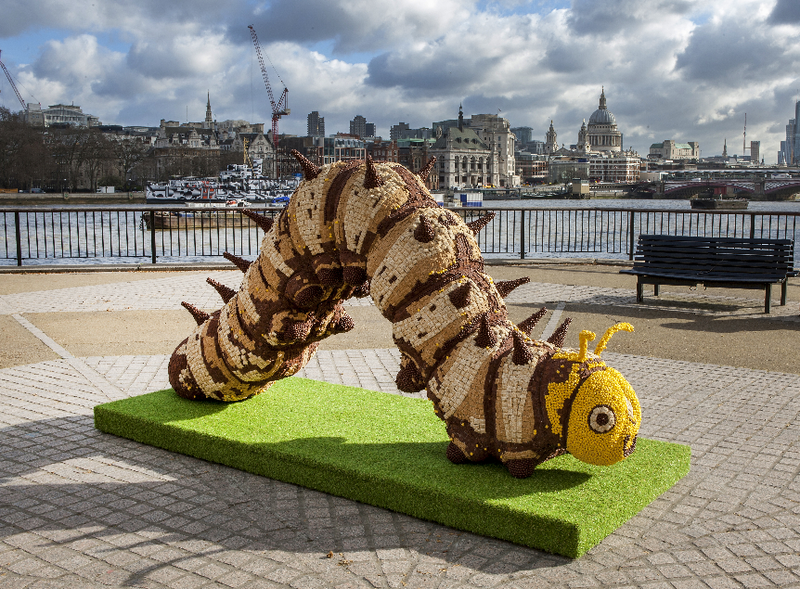 This gave nestle the idea to build a caterpillar of their own made from cereal. So they worked alongside food artist Prudence Staite to create a huge 10ft one to showcase just how nutritious cereal can be….. Myself and some fellow bloggers were set the challenge to get creative and come up with our own sculpture of sorts. Now we didn't have room for something quite that big in our house and my girls and big fans of creepy crawlies so we opted to make some butterflies. 1. Cut open your empty cereal packet and draw your butterfly on the inside of it. 2. Cut out your butterfly and then put it to one side. 3. Get two pipe cleaners and braid them together, creating your butterfly's antennas. 4. At this point slide cheerios on to both antennas, folding the pipe cleaners back on themselves to prevent the cheerios falling off. Then using sellotape, stick your pipe cleaners onto your butterfly. 5. Turn your butterfly over and using the sellotape again, stick the short end of a straw to the middle of your butterfly. You can now fly your butterfly around the room. My 7 year old actually made her own version, sticking cookie crisps to the wings of her butterfly. And my 9 year old who at the start pretended not to be interested, began to create something entirely different, a snail. I suppose the only question left to ask, would you eat creepy crawlies for breakfast?? Disclaimer : I was sent the tools and cereal to make the creepy crawlies however all thoughts and opinions are my own.